For most people, interacting with animals along the Everglades while enjoying the warm Florida sun is a mere daydream concocted in an office cubicle, or a part of a well-planned vacation. For Tim Schwartzman however, this is another day at work. Schwartzman has held his extremely hands on position at the Sawgrass Recreation Park since his family took over operations in 2005. 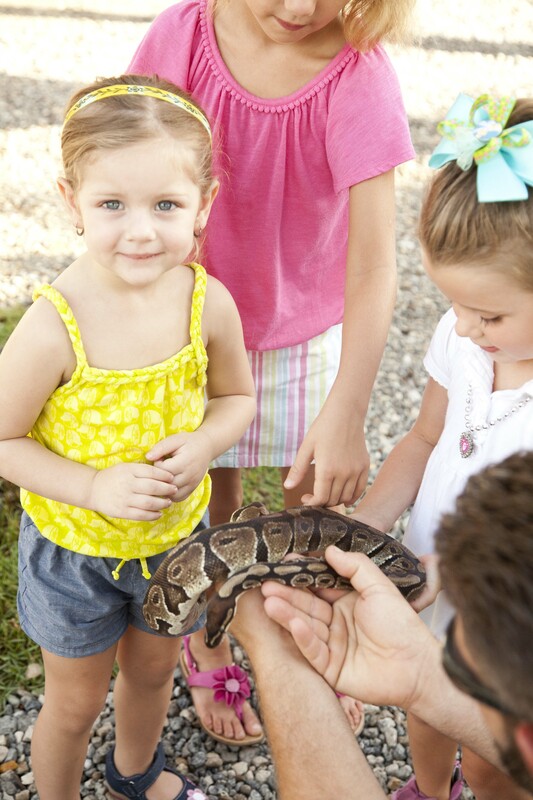 After learning in depth about the ecosystem of the Everglades on a half-hour airboat adventure, guests head over to the park where Schwartzman gives them a closer look at the creatures, big and small, that call the park home. With practiced precision, Schwartzman introduces the crowd to local species including panthers, bobcats and alligators. However, the park isn’t only made up of locals. The animals living in the park are just as diverse as the guests who come visit them. “People can experience what lives here naturally, but we also do have a variety of animals that come from all over the place as well, like African monitor lizards and black leopards,” said Schwartzman. 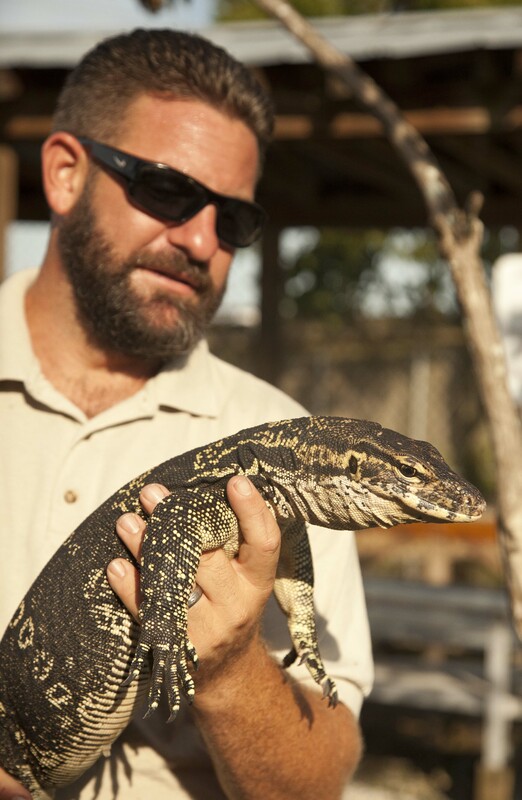 As one of three full-time animal handlers, Schwartzman works closely with all of the species guests see and says one of his favorite parts of the job has been building bonds with a special few, especially the Monitor Lizards. However, not all daily interactions are playful and fun. Between cleaning cages and moving animals, the animal handlers definitely get their hands dirty. “At some point, something is going to scratch you, bite you, pee on you, poop on you, and you have no control over that, it happens. I wouldn’t really consider that a problem, it’s a part of the job,” said Schwartzman. This positive outlook is most likely what allows Schwartzman to reflect with laughter on one of his messiest encounters. Schwartzman recalls helping to try and feed a sick crocodile through a feeding tube, and when a little too much food was pumped through at once, Schwartzman was on the receiving end of it. “The problem is, I’m sitting on the crocodile, holding it down and so basically I had a crocodile vomit in my face,” Schwartzman shared, with surprisingly high spirits. At the end of the day, dirtying their uniforms (or even their faces) is of little concern compared to the wellbeing of the animals. The staff works together and aims to learn from each other the best way to effectively care for the animals. Whether leading an education talk or a live performance, Schwartzman hopes to teach the audience is the importance of caring for and respecting the animals. “The one, most important thing that we try to convey is that we need to protect the wild lands and protect the places that they need to live, but also, in order to protect ourselves, we need to stay away from the animals when we see them,” said Schwartzman. While showing extreme care for these animals, Schwartzman also acknowledges that they are wild and should be treated with caution. 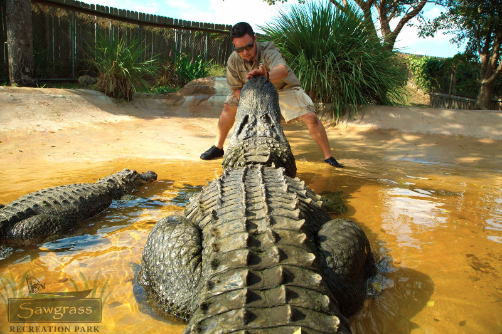 The ability to careful and closely view the creatures at Sawgrass Recreation Park is one characteristic that Schwartzman finds most special. “Our walkways are literally right next to the animal’s enclosures. You can be standing five feet from a 13-foot, 800-pound alligator and enjoy looking at it, examining it and seeing it up close,” said Schwartzman. Incredibly close up interactions accompanied by fun, educational facts from the handlers allow guests to develop totally new opinions about each of the 40-45 species. “It’s great being able to see people change the way they think about an animal, with something like a snake or something creepy-crawly,” said Schwartzman. 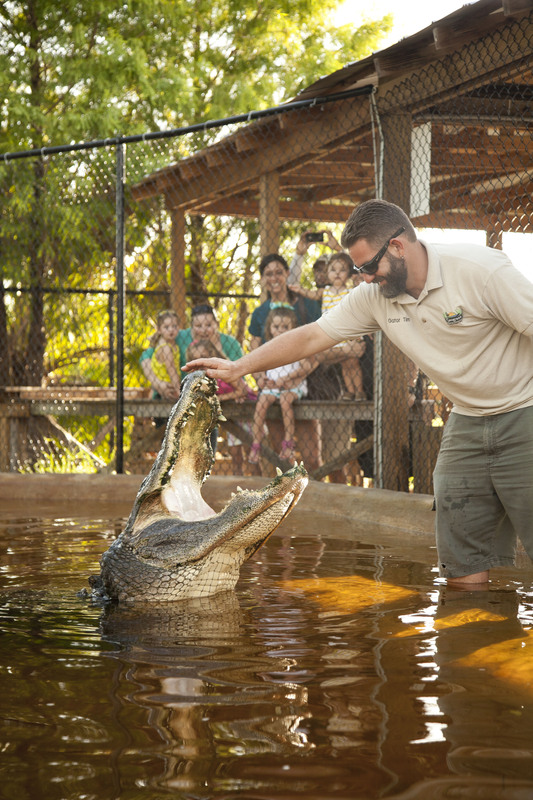 Thanks to Sawgrass Recreation Park’s hard-working staff members, like Schwartzman, guests can enjoy an action-packed day exploring the Everglades on land and water, and coming face-to-face with local and exotic animals alike.